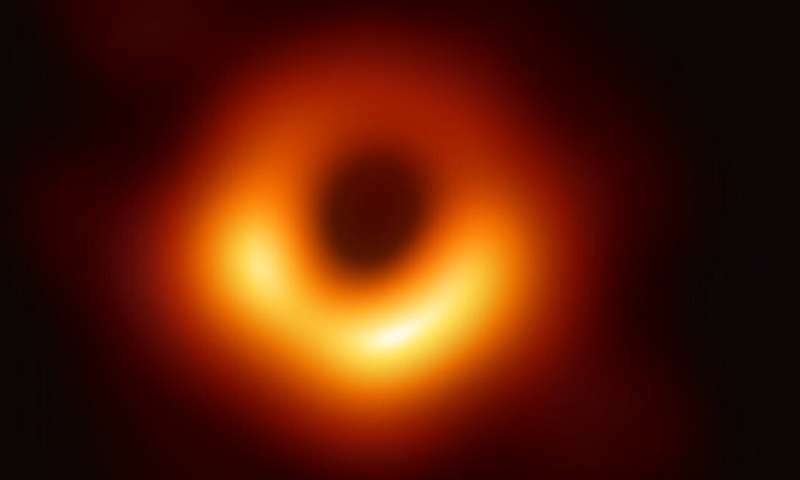 The ghostly image is a radio intensity map of the glowing plasma behind, and therefore silhouetting, the black hole's "event horizon"—the spherical cloak of invisibility around a black hole from which not even light can escape. It was the English astronomer John Michell who in 1783 first formulated the idea of "dark stars" so incredibly dense that their gravity would be impossible to run from—even if you happened to be a photon able to move at the speed of light. It is, however, far away, and the incredible engineering feat required to see such a target is akin to trying to observe an object 1mm in size from a distance of 13,000 km. While our galaxy may contain millions of John Michell's stellar-mass black holes—of which we know the whereabouts of a dozen or so—their event horizons are too small to observe. The EHT's targets are therefore related to the supermassive black holes located at the centres of galaxies. The term black hole actually only came into use in the mid- to late 1960s when astronomers began to suspect that truly massive "dark stars" powered the highly active nuclei of certain galaxies. The long journey to an image of not a BH, but a toroidal plasmoid. A decades long buzzkill for the Darkist acolytes. There is a suspicious lack of EU adherents talking about this image in public. It does pretty much look like what mainstream science predicted it would. Though everyone long ago thought that the earth was the center of the universe because they could see the stars and planets revolving around us. Could this image be something close to what they think they see and not be exactly that? Not sure what angle we are seeing, but it does look like a toroidal plasmoid or perhaps a hypertrochoidal magnetic field around a very large, dense mass. Read the article. The mass is such that it can only be a black hole. And the image looks similar to the simulations, because they used a BH in the simulations. That is lensed light. No plasmoid woo. The reason there is little comment from EUists is due to their scientific illiteracy. The same was also true for the gravitational wave detections, and the neutron star merger, in particular. If you expect more out of gravity theory than GR supremacism offers, and you are open-minded and smart about it, you may see indications of consciousness-type behaviors in non-living matter, you may see how some natural error correction mechanisms might work, you may see potential signs of counter-entropic effects, all pretty much flowing out of the idea of replacing holy "curved space" smoothness extremism with something that does not look for all the world like it despises quantum gravity in spirit from the get-go, as in spirit it is quite sure it can get away with such things using brain-washing mass-media repetition. But the current gravity supremacists won't enjoy that, their religious institutions won't enjoy it, so you can expect an absurd amount of resistance still to overcome. If you expect more out of gravity theory than GR supremacism offers, and you are open-minded and smart about it, you may see indications of consciousness-type behaviors in non-living matter, you may see how some natural error correction mechanisms might work, you may see potential signs of counter-entropic effects, all pretty much flowing out of the idea of disposing holy "curved space" smoothness extremism. But the current gravity supremacists won't enjoy that, their religious institutions won't enjoy it, so you can expect an absurd amount of resistance still to overcome. Nothing is trying to overcome it. Only cranks. "Nothing is trying to overcome it. Only cranks." Oh right, your the one who blew up when I said matter tends to retroflect gravity. It's just you, gaslighting me again. The smell of stinko loserville is growing from the orifices of your gravity gang. Was it not retroflection that triggered you? Did suggesting a static wave set you off, what?????? Speak now then bust off because I'm not interested in talking to you at all. Dark matter is all about the secrets of gravity-clown loserville. Lol. GR has yet again been confirmed in its biggest test so far, and you are prattling on about some unpublished woo. Get a life. So you believe in singularities? Infinite density? This is better explained by an ether theory where something massive enough that undergoes field coherency could have enough inertia and acceleration-back to the ether- to overcome Cartesian, polar, magnetic magnitude and literally vanish from the visible world. Lol. Aether theory! M & M got rid of that ridiculous crap in 1887. And many experiments since show it to be pure woo. And you need to realise that the singularity is an inevitable consequence of GR maths. It cannot exist in reality. It is therefore where we know GR breaks down. Something else is needed. And it ain't aether woo! Nobody writes about that crap in the scientific literature any more. Get a new blood supply, dark matter sucker. GR and curved space are near-sighted galactic crap and you know it. You get so infantile, sociopathic and pig-insecure about your secret gravity failure called dark matter. 2nd request re your special losing quest to gaslight me endlessly with nothing but Einstein drag-queen pom-pom logic. So far it's only you alone who needs to block me, boring-woo-boy. You get so infantile, sociopathic and pig-insecure about your secret gravity failure called dark matter. 2nd request re your special losing quest to gaslight me endlessly with nothing but Einstein drag-queen pom-pom logic. So, you alone need to block me, boring-woo-boy. Idiot. Where is your crap written up? Stop making up stories, you clown. Castle-ninny, hero of the stupid in gravity, strikes again. Anything but your gravity is a slur against all of your underground necro-maniac special relatives, no doubt. The boy who lost his cerebrum in a horrible Einstein-cow-horn-blowing exercise, is acting up again. You should block me or find someone for special pom-pom ops reinforcement. That should be revealing, wormhole-boy. Or else, keep false-flagging against the facts, gravity-bomber. Castrata-domingo the special needs gravity bomber gaslight boy can't find any one else willing to back up his sociopathology here? Can't believe it! Incredible. What a spongy putz. M and M didn't prove anything, either way. It wasn't even an experiment. Check out Dayton Miller's work. In the photoelectric effect, Einstein 1905, did away with the need for an ether with discrete quantized packets. Relativity and quantum mechanics are rehashed Greek Atomism. All phenomena is ether manifest as magnetism. Everyone is bored to death by arguments between incompetent general relativity cheerleaders and electric universe sock-puppets. It's loser takes all. There it is, whether you deny it or not. A picture of a black hole. It makes you all look like idiots, but that's what it is. Get over it. "It makes you all look like idiots"
Because it's a waste of time and money, goofball button-eyed monkey-boy. Nope. That is merely your untutored opinion. Worthless. Does this damn website have any moderation at all or do they just spend their time constantly rearranging the css? @cantdrive85: can you give some figures of the magnetic field of said toroidal plasmoid and the corresponding emitted radiation frequency and intensity of the plasma inside it? Then link us to the alternative. In the peer-reviewed scientific literature. Or be quiet. Says the thicko whose Nobel worthy 'hypothesis' only exists in his own mind! Show us the science, Dunning-Kruger boy.